The president’s plan for big rate cuts relies on the unrealistic assumption that GDP will hit 3 pct and be enough to cover any revenue shortfall. The U.S. deficit, though, is growing at an alarming pace. Republican lawmakers are likely to demand a do-over before giving it a pass. U.S. National Economic Director Gary Cohn (L) and Treasury Secretary Steven Mnuchin unveil the Trump administration's tax reform proposal in the White House briefing room in Washington, U.S, April 26, 2017. 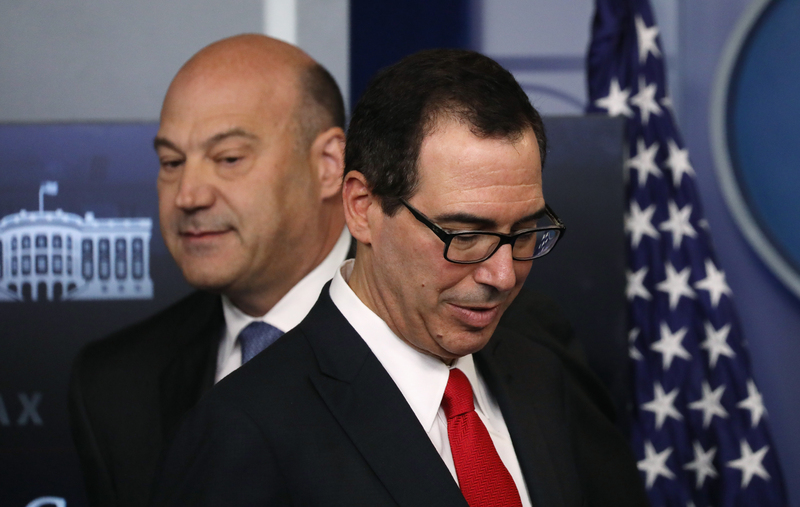 U.S. Treasury Secretary Steven Mnuchin and National Economic Council Director Gary Cohn unveiled a blueprint for tax reform on April 26. The plan includes cutting the income-tax rate for businesses to 15 percent from the current 35 percent. The cut would apply to so-called pass-through entities, which include sole proprietorships, limited-liability companies and partnerships. These entities pay taxes through the personal income levy imposed on their owners and are used by hedge funds, real-estate firms and small businesses. The proposal closely follows the plan Donald Trump released in 2016 when he was a presidential candidate. It doesn’t include a border adjustment tax, which is part of a proposal backed by Republican leaders of the U.S. House of Representatives.